In the heart of Port Stephens. Colonial Ridge Retreat in the heart of Port Stephens is a love collection of self contained cottages. Check for the best room rates and book online. 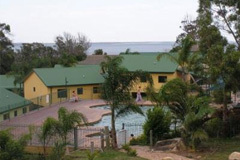 See other hotels in Port Stephens. An ideal coastal escape for families, friends and couples, with 42 self contained two bedroom cottages. Each cottage opens onto a shady verandah, and features the amenities you require for a self catering holiday. The Cottages are surrounded by landscaped gardens, and facilities including salt water pool, tennis courts and complimentary electric BBQ’s. Colonial Ridge Retreat is conveniently close to many local attractions and activities in the Port Stephens area. Port Stephens is renowned for its pristine sandy surf beaches and bays, world class golf courses, restaurants and cafes. The Cottages are surrounded by landscaped gardens, and facilities including salt water pool, tennis courts and complimentary electric BBQ’s. Guests at Colonial Ridge Retreat Salamander Bay can utilise the swimming pool and tennis court onsite while their stay at this property. There is also a tour desk, where the guests can clear their queries regarding the area attractions of the city. Discount Vouchers for local attractions and activities are complimentary at Colonial ridge Retreat. Each Cottage has a shady verandah and is surrounded by landscaped gardens and some have ocean views.